On Sunday, March 10, participants jumped on spin bikes at Spin4Heroes, powered by Roche, to pedal for four hours and support this crucial Heroes Foundation fundraising event. Over $85,000 was raised — pushing us beyond our fundraising goal and generating funding that will provide support to cancer patients, education to promote cancer prevention and resources to advance research for a cure! For the first time in its 9-year history, Spin4Heroes offered cancer fighters a way to participate remotely. In contrast to our traditional 4-person spin teams, this 1-person registration created a way for individual cancer fighters of all ages, near and far, to be active for the Indiana cancer community. Individuals simply signed up, raised money to support their efforts, and got active! The bike, running shoes, or yoga mat was just the vehicle to achieve our end-goal! Look for more info to come soon on the launch of the 2020 Spin4Heroes remote program. 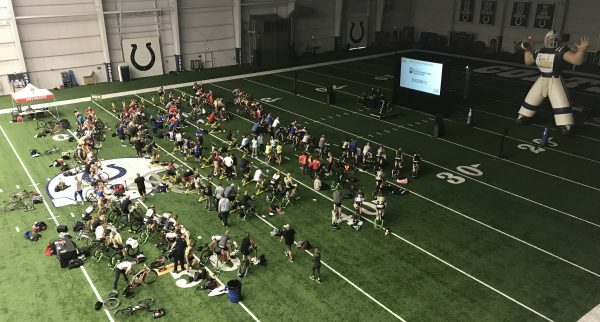 The Indianapolis Colts for their generosity in allowing us to host Spin4Heroes at the Indiana Farm Bureau Football Center. The many in-kind donors that provided support, participant and raffle prizes, we are so very grateful! In 2020, we will stage our 10th anniversary Spin4Heroes event. Stay tuned for more information as the planning continues for next year’s event.